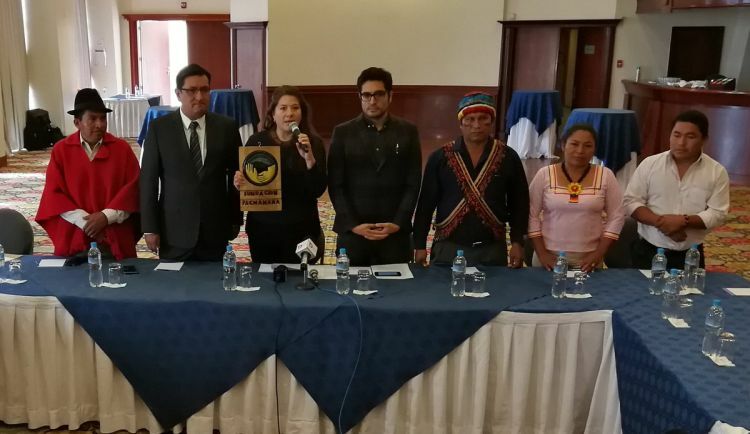 One of the organizations dissolved under the previous regulations, the Pachamama Foundation, recovered its legal status after the Ministry of the Environment recognized that its right to defense had been violated. Although the enactment of a new regulatory order gives a break to social organizations, critics claim that there are still unconstitutional habits that should be corrected to guarantee free association. Stakeholders say the government’s excessive control over the actions and finances of organizations has been reduced, but problems remain. In the last four years, Ecuador’s social organizations have tiptoed over a series of obligations (Executive Orders 16 and 739) imposed for their own subsistence by former president Rafael Correa’s administration. The orders included conditions that limited their activities, allowed their dissolution for numerous reasons, and established a series of obligations. Those obligations were considered interference by directors of indigenous, environmental, and human rights organizations consulted by Mongabay Latam. 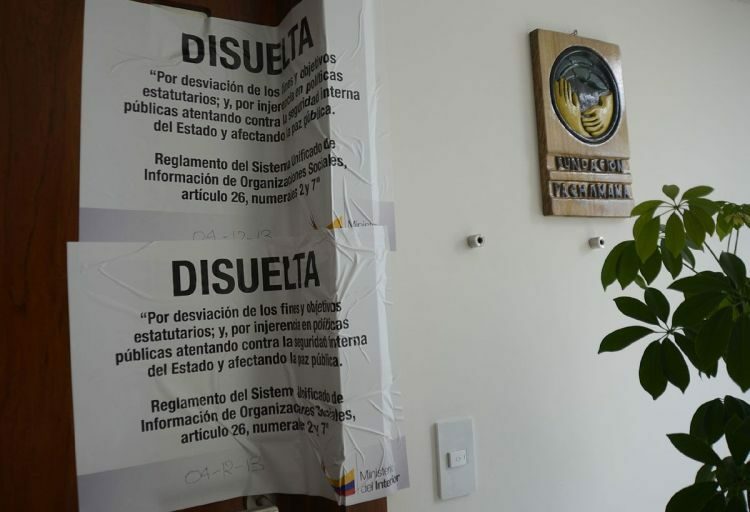 This shadow has begun to dissipate with the repeal of these orders by President Lenin Moreno, who, despite having come to power last May, is still appearing to try to maintain distance from his predecessor. Moreno is currently struggling to retain control of his political party, Alianza País. On his national TV network on Monday, Moreno claimed that with the new Executive Order 193, which replaced the orders that were repealed, “we’re responding to a heartfelt demand from diverse social organizations, which expressed their unease because of the excessive control that these regulations contained.” He also said that they wanted an active nation and that “to think that this is going to promote violence is to believe in a policed and authoritarian state. On the contrary, in a state of law, free association is promoted.” He added that the organized participation of citizens is fundamental for democracy. “What we’re seeing is that they’re removing an order that, in some ways, forced many organizations to have to defend themselves instead of doing the work that they are constituted for,” said Esperanza Martínez, a member of Ecological Action. That organization almost disappeared in December 2016 because of the application of Executive Order 739. The Ministry of the Interior accused the organization of supporting violent acts that were attributed to the Shuar indigenous community, who opposed the open-pit San Carlos Panantza mining project in the Amazonian province of Morona Santiago. “We are content because we think that this form of censorship over organizations is being overtaken, concealed by these obligations that were so unpleasant in form and in content,” Martínez added. Although on this occasion Martínez prefers to see the glass as half-full, she recognizes the concern that the new Executive Order 193 brings to people. “We want to believe in good faith and we want to believe that the vision of seeing organizations as enemies is being undone,” she said. Representatives from social organizations consulted by Mongabay Latam argue that the issuance of the new order is a display of political goodwill by President Moreno’s administration – although some representatives are critical. “It’s a half-triumph of social pressures,” said Harold Burbano, a legal advisor from the Regional Human Rights Advisory Foundation (INREDH), who discussed some advances and concerns that the new resolution brings. “What executive order 193 does is facilitate, for civil society, the creation of organizations or the obtaining of legal status, but not with the background of the problems and vices that executive orders 16 and 739 had,” Burbano said. Burbano explained that the requirements for creating a non-profit organization have been reduced substantially, which he says is important because it promotes legal organization. He also says it will reduce the government’s interference in discussions carried out within organizations, and surrounding the use and collection of funds. “Executive Order 16 established the obligation to send all the minutes from the organizations’ meetings to the Secretary of Political Management and to the governing institution of their legal status (the ministry of the involved branch), which was in violation of the right to privacy of organizations. This has been changed by executive order 193,” Burbano told Mongabay Latam. The second problem with Executive Order 193, according to Burbano, is the possibility of dissolving organizations by open causes. “It’s something that hasn’t changed, and the decree is still unconstitutional in that sense,” he said. He also expressed another criticism: the lack of a procedure that respects the rights of the organizations during the process of dissolution. “Even though executive order 193 establishes the possibility of regaining legal status — that is to say, to revive an organization — both in executive order 16 and in 739, as well as in 193, there isn’t an established process in which an organization can have the right to defense,” Burbano said. These concerns are shared by Juan Auz, who was the executive director of the Pachamama Foundation when President Correa’s administration dissolved it unilaterally in late 2013. The administration subsequently accused him of participating in a violent protest and of digressing from their statutory objectives. “One of the most serious issues of the new decree is that it maintains the problematic causes of dissolution, including some that were used to dissolve the Pachamama Foundation — for example, the cause of digressing from the reasons it was constituted and the cause of intervening in activities reserved for political parties,” Auz told Mongabay Latam. He claims that these causes are ambiguous, and that they can be subject to the discretion of officials. “They can potentially be used to keep dissolving organizations,” he said. Vargas claims that executive orders 16 and 739 were used to delegitimize the struggles of social organizations and create division in the indigenous movement, and that things haven’t changed much. He also said that President Correa’s administration used these regulations to promote pro-government Indigenous organizations. “Imagine that they almost ignored us and they wanted to create a similar CONAIE, which would be under the criteria of Correísmo (the principles of President Correa’s administration). Then this caused us a lot of harm because some ghost organizations were created, which didn’t represent the people and nationalities,” Vargas said. He also remembers the disbanded National Union of Educators (UNE), Ecuador’s main teachers’ union, which had 66 years of legal status. It was dissolved in August 2016 by the Ministry of Education, after it was alleged that it had incurred various breaches within its registry. Jorge Yunda, a member of the assembly of the government movement Alianza País, is receptive to the concerns of organization leaders. He said he is ready to help continue the dialogue promoted by President Moreno to resolve remaining differences. “I believe in the full right of the citizens to organize, for their free association. The more free, the better,” Yunda said. Like others interviewed, he thinks Moreno’s new executive order is an advancement in policy. “But the organizations can keep fighting for their platform. I can help in that way; try to be a bridge with the government,” he told Mongabay Latam. According to Auz, former executive director of the Pachamama Foundation, the enactment of executive order 193 by President Moreno represents legitimization. “Executive Order 16 was the shadow of the previous administration, and you read in the media that [Executive Order 16] is already a reason to applaud the new government, but when you review it well, analyze it well, it shouldn’t be a reason for congratulations, but rather for concern,” Auz said. In regard to his work at the Pachamama Foundation, Auz said “we were an agent of important change; from civil society we influenced many political discussions at the national level, and we tried to develop specific projects in favor of different nationalities.” Among their work was conducting training in human rights and environmental rights in indigenous communities “that were, and continue to be, threatened by extractive projects in their territories,” Auz said. The government heard the demands of the members of the Pachamama Foundation, and on November 20 — shortly after Mongabay Latam spoke with Auz — the Ministry of the Environment announced the restoration of the foundation’s legal status. The government recognized that the previous administration had not given the Pachamama Foundation the opportunity to defend itself. 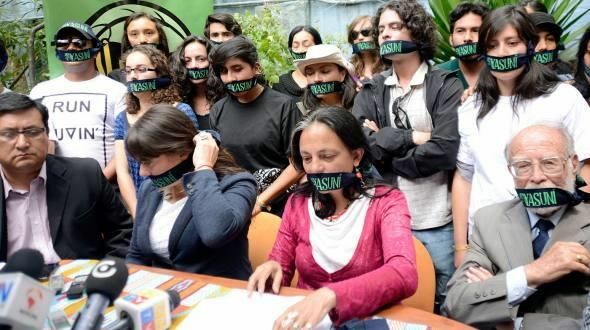 “The General Judicial Coordination resolved to extinguish the administrative process initiated over the Pachamama Foundation, because the administrative sanction issued in 2013 violated the due process and the right to defense,” according to an official statement. The Pachamama Foundation celebrated the government’s decision. “This is a historic victory for organized civil society, including the country’s indigenous and environmental movements, which have worked tirelessly for the protection of human rights and of nature,” according to a statement released by the foundation entitled “The Pachamama Foundation Gets Back to Work in Ecuador.” Afterwards, Belén Páez and Juan Auz, spokespeople for the foundation, claimed that the government did not put conditions on them to return legal status and that at this time, they will not take action against the officials who closed their foundation. Meanwhile, their lawyer, Esteban Melo, says the lawsuit that the foundation filed with the Inter-American Commission on Human Rights will continue. All of this was said in a press conference, during which they were accompanied by the Indigenous leaders who support them. All those who were interviewed by Mongabay Latam agreed that environmental organizations were among the most affected by Executive Orders 16 and 739, which were issued in 2013 and 2015, respectively. “The very fact of their existence was a clear message of intimidation towards the organizations that are defending the territory,” said Burbano of INREDH. He also said that “they were established as a cause for dissolution in the national regulations, and going against the extractive industry was what put us at risk.” However, Burbano claims the greatest dangers have been faced by the people who inhabit the areas where socio-environmental conflicts develop.